If a dictionary of comedy ever becomes a reality, Mel Brooks' photograph is a shoo-in for placement by the "F" word: Fearless (and judging by the way this review is beginning, I think the man's twisted humor is beginning to rub off on me). From high-kicking Broadway Nazis to cowpokes with gas around the campfire, no target was too sacred in his heyday. Although his bullseye percentage lowered after a triumphant ten year-plus streak of uproarious films (including The Producers, Blazing Saddles, Young Frankenstein and High Anxiety), even lesser Brooks efforts are ten times funnier and more creative than what passes for most modern day comedies in the here and now. 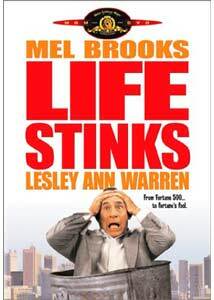 Unjustly overlooked upon its 1991 release, Life Stinks is perhaps the best of the producer/writer/director's lesser known output. Brooks portrays Goddard Bolt, a heartless millionaire businessman who wants to buy a rundown area of L.A., give it a snazzy makeover and revel in the profits. Arch-rival Vance Crasswell (Jeffrey Tambor) has similar designs on the property and the two engage in a bidding war with Bolt betting he can spend 30 days as a homeless person without leaving the area in question. Sans mustache, wallet and tie, the clock begins ticking. Barely a few hours into his quest, Goddard�s already doing the spit/polish routine on car windshields, dancing for coins and seeking shelter inside a drainage sewer only to find he has to share the premises with several hungry rats. Friendlier contact comes by morning in the form of loopy but sweet derelicts including Sailor (Howard Morris), Fumes (Teddy Wilson) and Molly (Lesley Ann Warren), the latter of whom comes to Goddard's rescue during a near fatal beating attempt. Edgy, eccentric and more than a little funny in the head, Bolt warms to her and is rewarded with a friendship that not only changes his one dimensional view on the homeless, but leaves him wondering if a huge bankroll truly makes one rich. Hopefully I haven't made the plotline of this film sound like a cavity-inducing after school special but this isn't your typical Mel Brooks laughfest. Even on my first go round, I felt a little underwhelmed by the drastic cutback in sight gags and one-liners that Mel lovers are so accustomed to. However when viewing Life Stinks a second time with its accompanying commentary track (explored later in this review), I appreciated and enjoyed it so much more. Intended as a homage to the madcap yet heartfelt comedies of Preston Sturges, echoes of Chaplin-esque sweetness a la Modern Times can also be felt, particularly in the romance between Brooks and Warren. Although some may quibble with the film's sentimental tone, this was a very effective change of pace for the director and I applaud his restraint in going for cheap laughs at the expense of the homeless (which is probably what many were initially expecting). Casting has long been one of Brooks' strong points and this stellar ensemble is no exception. Long time comrade Morris (who worked with Mel on Your Show of Shows and went on to portray the belly laugh inducing Ernest T. Bass on The Andy Griffith Show) is a major standout as is the ever dependable Tambor. Veteran character actors Teddy Wilson, Stuart Pankin and Robert Ridgely (the Colonel from Boogie Nights) also offer strong support. And then there is the lovely Lesley Ann Warren, whose work rivals her acclaimed role in Victor Victoria (particularly in a comically bittersweet scene in which she acts out the dissolution of a once happy marriage in less than a minute's time). As a bonus, she gets to put her ballet training to good use in a delightful sequence paying homage to those classic Astaire-Rogers musicals of old. Even Brooks acquits himself nicely, showing incredible depth in the more drama-tinged moments; it's a wonder the veteran performer hasn't done more straight dramatic roles as Jim Carrey and Peter Sellers have. Image Transfer Review: Life may indeed stink from time to time, but this transfer certainly doesn't; it's one of MGM's finest in recent months. With the exception of a couple of location scenes where lighting problems couldn't be alleviated, this is as good as it gets. Beautiful color saturation along with accurate and natural fleshtones, this movie looks as it could have been shot days ago. A full-frame transfer is also included, but the widescreen is much more complimentary. Audio Transfer Review: Typical of many comedy soundtracks, dialogue is anchored in the center, but the film's pleasant and whimsical score is treated well by a better than average Dolby 2.0 mix, which boasts good separation. Extras Review: A laid back yet funny commentary track gathering Brooks and co-writers Rudy De Luca (who also has a small yet memorable role as a delusional street person) and Steve Haberman is the big draw here. Revelatory it's not, but for those who love anecdotes and behind-the-scenes nuggets, you'll find them in abundance here (and I can't recall too many moviemakers that are so generous in sharing glory and credit as Brooks does; he truly sounds like a blast to work with). Among the topics discussed by the trio: their luck in landing Warren as a leading lady; bittersweet memories of now departed cast members (including Wilson, Ridgely, Billy Barty and long time Brooks pal, Ronny Graham, who served as a story consultant for several seasons on M*A*S*H) and the joys of running in 100 degree heat. More war stories and thoughts make up the bulk of Does Life Really Stink?, a 14-minute featurette that stands well on its own and repeats very little from the commentary track. An original trailer, a teaser for the special edition release of The Producers and a teaser for popular MGM faves on DVD are included. Go in with lowered expectations and Life Stinks will come out smelling like a rose. Great performances, a witty yet compassionate script and a good story that doesn't go for easy laughs make for a solid piece of entertainment.